One of the givens of any election campaign is that you need a decent portrait photo. After all, who is going to vote for anyone who doesn’t have a decent portrait photo? That would just be crazy. 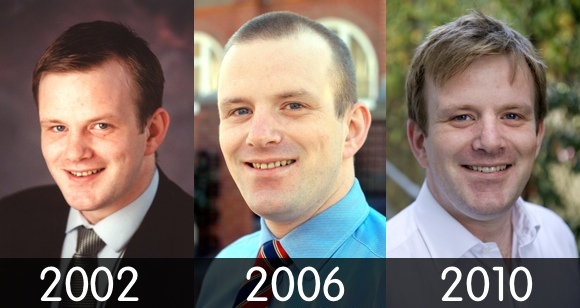 And now that my 2010 one has finally appeared on a leaflet I thought I’d dig out the photos from previous elections. I could only find three – from 2002, 2006 and, of course, 2010. To be honest, while I know I have the 1998 photo somewhere I also know I have a real Tory boy look and, therefore, not much incentive to find it to republish it to the world. I’m fairly confident no-one has actually kept a 1998 leaflet and that’s definitely for the best. However, to give you an idea of how I would have looked in 1998 when first elected here’s a photo of me taken during my incredibly close battle for the Great Grimsby seat in 2001. If that’s not Tory boy I don’t know what is. And this set me thinking. 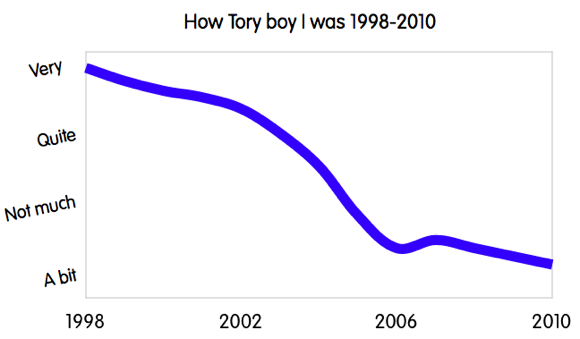 What if I were to assign a Tory boy rating to myself over time, how would that graph look? Would there be any interesting or telling patterns revealed? So that’s exactly what I did. Clearly Tory boyism is a subjective measure. But I’ve tried to assess it objectively, using measures like parting and hair neatness, fondness for ties and level of political ambition. And I was astounded – my Tory boy rating seems to be inversely related to the Conservatives Party’s electoral fortunes and poll ratings. Now I know some may be eager to point out that correlation and causation are totally different things. But I have to ask, can I take the risk? Should this graph be what guides my next haircut? And should I be scheduling it for 6 May? James, somewhere I have your picture in 1998! Go on be a Samson and get in with the 1970s hair look that’s back in vogue amongst some teenagers….but I suspect Samson had a beard too, so go on let your hair and whiskers down in the service of your party! I would never have dreamt you still cared.